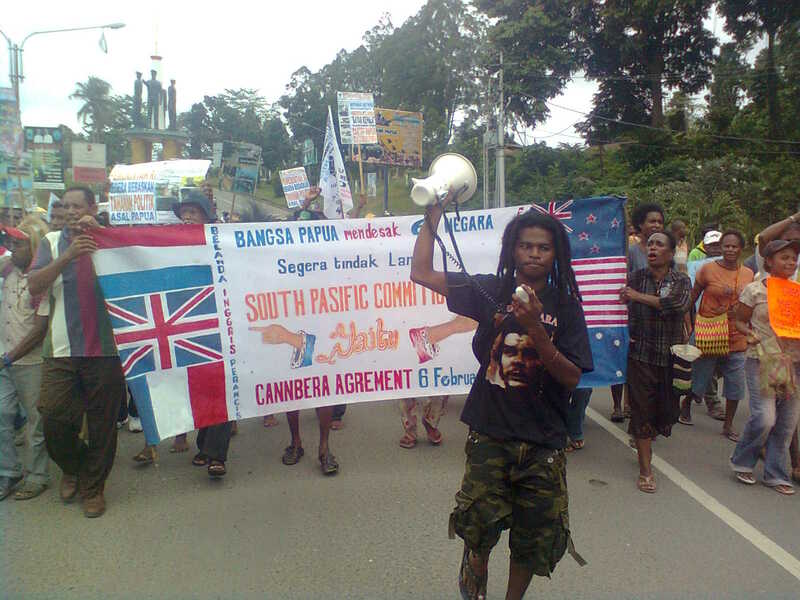 Well over 1000 people engaged in a colourful and vibrant demonstration calling for West Papuan independence on Manokwari on January 17, despite Indonesian police banning the march and the display of the Morning Star Papuan Independence flag. Amid worries of a security crackdown and violence from Indonesian security forces, organisers of the rally reported a generally peaceful event, with participants well-disciplined against reacting over severe intimidation tactics, preferring instead to use music, drumming and free expression to get their message across. Organised by activists from the former Federated Republic of West Papua, the Manokwari protest saw several groups of singers, dancers and drummers converged at the Sanggeng sports stadium, marching 7 kilometres to the church at Elim Kwawi over four hours. They were shadowed at all times by at least police to secure the action is over 200 police personnel, 2 truckloads of soldiers, 8 armed motorcyclists, and an extra truckload of elite Dalmas Riot Police (a unit that includes personnel from the Detachment 88 anti-terror group funded by Australia). To the shouts of “Merdeka!” (Freedom! ), and accompanied by 4 groups of drummers and 2 flute bands, over 100 banned Morning Star flags were flown during the march, held high by mama-mama, youth, children and students. Sources at the march reported to West Papua Media that spirits were high amongst participants due to the music and dancing. International solidarity actions were held outside the Indonesian Embassy to the United States in Washington DC, and also in the Solomon Islands, and Melbourne, Australia. Rexy Roses, from the new Solomon Islands for West Papua solidarity group, called upon the Indonesian government to immediately release West Papua and Malukan political prisoners, and to respect their rights to free expression. “More than 50 years of tyranny and immeasurable human rights abuses suffered by the Indigenous people of West Papua at the hands of the occupying Indonesian Military forces is more than too much to bear, it is time now time for dialogue and negotiations to end violence in West Papua and to allow for a peaceful referendum. This year 2013 is going to be a very challenging year and we will make sure that the cries of the indigenous Melanesian people of West Papua be heard in every corners of Melanesia, the Pacific and beyond, it is time for change, together lets stand for the change we want to see in West Papua and Maluku, ” Rexy stated. 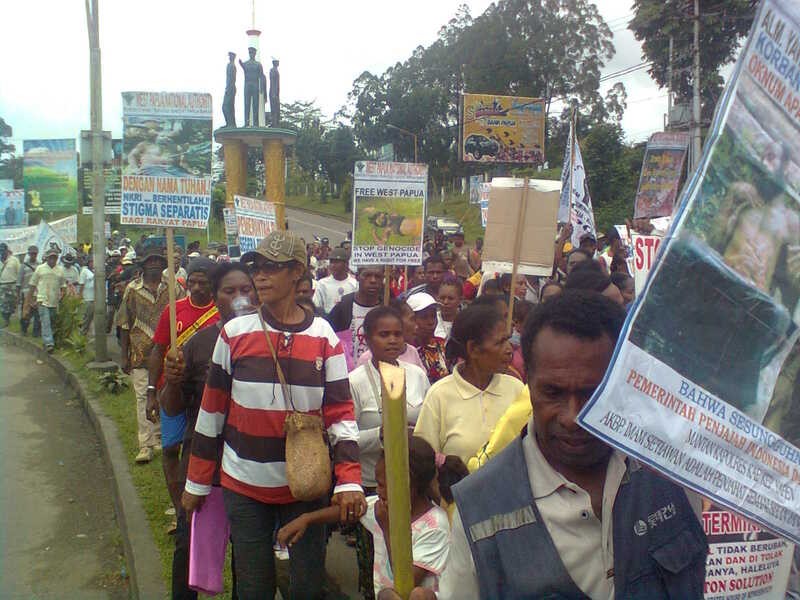 Organisers of the rally had notified Indonesian Police of their rally but the Chief of Police in Manokwari forbade the rally from going ahead, contrary to the rights of peaceful expression guaranteed to West Papuan people under the now discredited (but still active) Special Autonomy legislation of 2001. However, according to reports from witnesses and our stringers, police stood by and allowed participants to gather, instead focussing their attention on the seizure of Morning Star Flags. Upon an attempt to formally raise the Morning Star on flagpoles, police moved in and attempted to seize flags, however organisers led by West Papua National Authority Executive Governor of Region II Manokwari Markus Yenu negotiated with police, who allowed the mass to continue after receiving assurances that no flag raising would occur again. However, outside Biryosi petrol station, police seized flags from a young man, escalating into a tense situation due to the hostility between individual police officers and the youth. 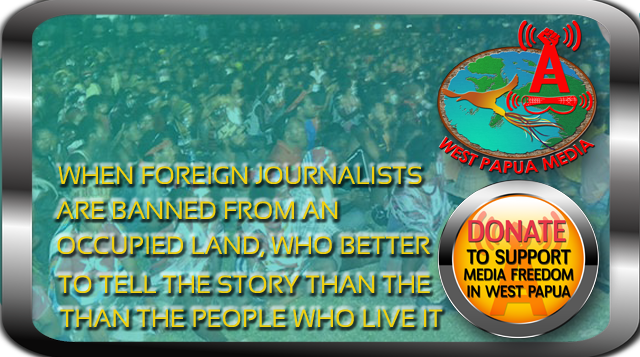 According to West Papua Media’s stringer at the protest, ” the journey became increasingly tense as Police officers began intimidation by beginning to walk ahead (faster) than the rear of the masses,” whilst in riot gear, using a common riot police tactic of dispersal. “The Massa (collective group) felt that a scenario was being created by Indonesian police to disrupting the peaceful demonstration and provoke violence. This situation occurred precisely around Copal Sanggeng Manokwari. 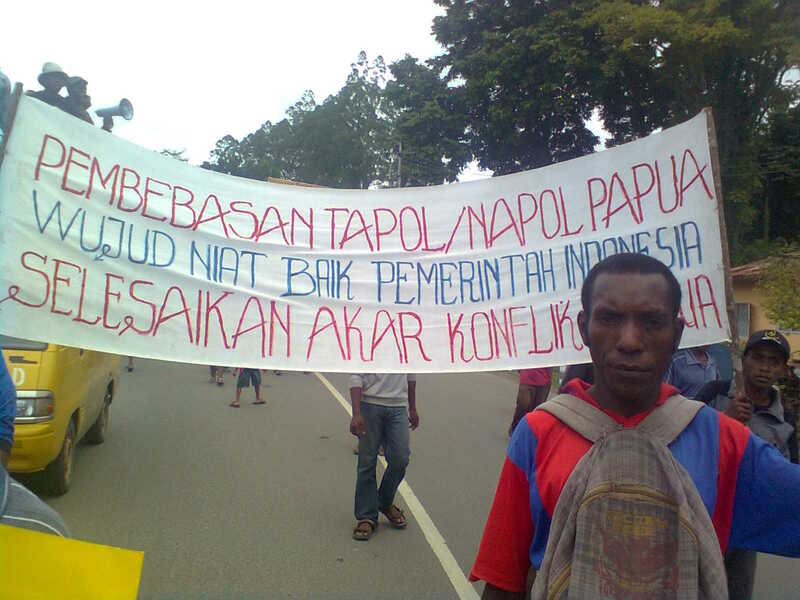 However our koorlap (Koordinator Lapangan or field coordinator) were able to ensure massa discipline and not be provoked by friction generated by these police officers,” one field coordinator, who cannot be named, told West Papua Media. The Rally dispersed peacefully around 3.30 pm local time after speeches by West Papua National Authority, Federated Republic of West Papua, and other activists, followed by prayers, with no reports of further intimidation of participants from security forces. In Yapen meanwhile, security force intimidation and the arrest of seven activists on January 16 in Mantembu village by an Indonesian Army (TNI) unit, prevented the planned demonstration from taking place in Serui town. Reports received by West Papua Media from human rights sources early in the day described a tense atmosphere with several hundred heavily armed police and army patrolling key protest gathering point. Unconfirmed reports claimed that a joint police and army unit blockaded roads outside Mantembu village and threatened violence on any potential protest participants. 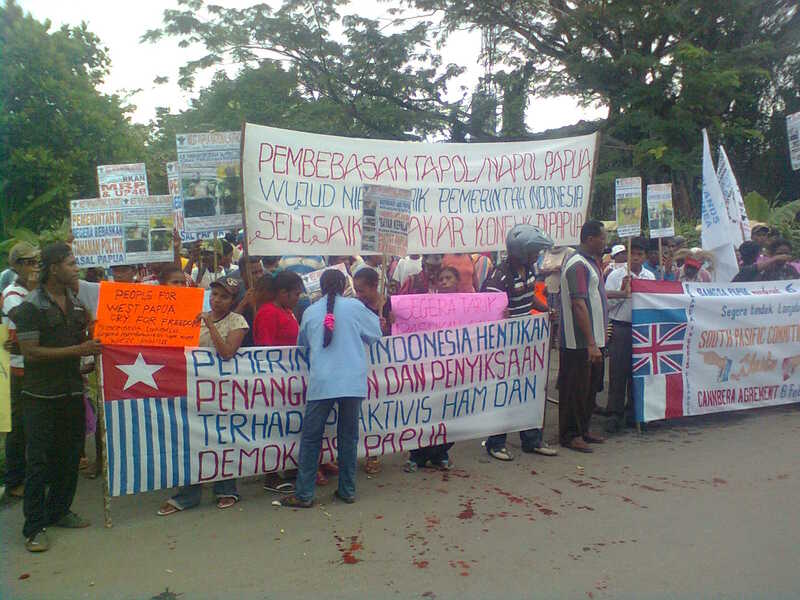 Manokwari, June 10, 2011: Over 5000 people have gathered peacefully in Manokwari, West Papua, watched by about 200 security forces, to call for the release of political prisoners and detainees in Papua. 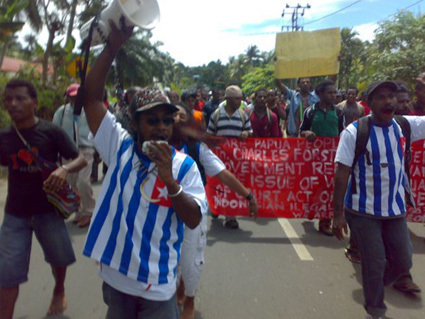 At time of publication (1530 West Papua Time), the gathering has paralysed Manokwari, according to organisers, but is unimpeded by security forces..
Organised by West Papua National Authority (WPNA), the rally began with a three mile march from Sanggeng soccer stadium to the government’s provincial office (DPRD) at Manokwari. Thousands of Papuans were chanting “Thou Shalt Not Kill”, calling on the Indonesian government to end human rights abuses. “Currently the situation in Manokwari is fine and is understood that there are military personal and POLRI present at the scene”, said Markus Yenu, Governor of Area 3, Manokwari. Mr Yenu highlighted that 100 security personal in civilian clothing and 20 POLRI surrounded the civilians. “We have paralysed Manokwari, but our aspiration is for peaceful action”. The rally dispersed peacefully with a closing prayer by Reverend Terryanus Yoku. The majority of demonstrators were women and children. Yohanna Wainggai, a housewife representing Melanesian Women in West Papua, said “I have to leave all my household duties and come down to this rally to speak on behalf of my children, who completed their studies but have no jobs provided after their studies”. The organisers were pleased with the demonstration. Hans Sakorai, chairman of FNMPP (Front Nasional Mahasiswa Pemuda Pelajar Papua or National Front for Papuan Youth and Students) stated “our peaceful rally has nearly 200 military personnel present, but no violence erupted”. Jack Wainggai, spokesperson for the executive president of WPNA, demanded the “Indonesian authority to release all political prisoners,” and he calls out “for the international community such as Australia, USA and the UN to seriously consider the aspirations of West Papuans for self-determination”. STRUGGLE IN PARADISE ( NU BOTENANG DOHONG BE DOA SYAI), Follows the extraordinary journey of Herman Wainggai, a West Papuan independence leader and former political prisoner, living in exile in Australia. In West Papua, Herman spent more than 20 years as an activist in a nonviolent student’s movement. In 2006, Herman feared the safety of his life and led a group of 43 West Papuan asylum seekers to Australia. In Australia his activism continues, spurred on by daily text messages from inside West Papua which report an increase in Indonesian military and intimidation. When Herman receives the confronting news that a man from his island was killed by Indonesian authorities, he decides to hold a meeting with fellow West Papuan student activists at the border of West Papua and Papua New Guinea. After the risky boat journey, the student activists inform Herman of the current situation in West Papua and the risks they face as activists fighting a nonviolent struggle..